at Nebraska Public Television Studios, August 12th, 1999. Frank flew in to be the Star of an evening that featured his videos and I co-hosted with Leta Powell Drake. Irish Culture and Customs website. Do visit it for info about anything Irish! 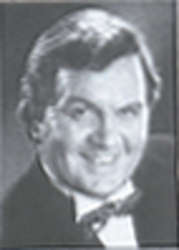 Perhaps the tenor who most-deserves the title of successor to John McCormack, was the late Frank Patterson. As with McCormack, he was a winner of the prestigious Fesh Coil competition in Dublin. Born in Clonmel in County Tipperary, Frank trained in Paris (McCormack studied in Italy) on scholarship in his 20’s with Janine Micheau. Working with top conductors such as Sir Colin Davis and with the best orchestras in Europe, Frank earned a fine reputation in the 1960's, 1970’s and early 1980’s as a classical singer of Handel, Mozart, and Bach oratorios and German, Italian and French song. Indeed, his singing of the role of the Evangelist in J.S. Bach’s St. John Passion was given fine reviews. In the mid-1980’s he moved his family to the U.S.A., where his career, now concentrating on lighter music, flourished in nationwide concerts and on Rego Records Lps, tapes and CDs. He appeared in the films “The Dead” and “Michael Collins,” and was heard singing “Danny Boy” in the movie “Miller’s Crossing.” Honoree of several titles from the Vatican, Frank was a devout and energetic exponent of his faith, often offering his services to various Church-related charities. He told me personally in 1999 that his singing for the Mass given by Pope John II in Ireland in 1979 was the highlight of his career. Frank, with his family, presented two concerts at the White House, for the Reagans in 1982 and the Clintons in 1995. As a student in the early 1970’s, I found Frank’s Lp recording entitled “My Dear Native Land,” which made me an admirer of this excellent singer with the slender, well-produced Celtic tenor voice. After that I bought a number of his records and tapes as they were released, including the Beethoven arrangements of Irish songs; Berlioz songs; Purcell songs and others, all on the prestigious Philips label. Through the years, as I operated a music shop, I followed his career and sold his Lps, cassette and VHS tapes and then CDs. He gave a concert for the director of Boys’ Town in Omaha in 1992, but we were presenting a concert the same evening, so could not attend. We finally heard him in concert, twice—in November, 1998 and again in September, 1999, in Omaha. Not only was the voice superb (for a tenor of 60 years!) those many years later, but his engaging manner and sincere showmanship with the audience was delightful. I was honored to share a “stage” with him at Nebraska Public Television in August, 1999, and even sing with him, as we co-hosted a fund-drive for PBS. He told me a number of interesting facts about his life and career, including that he had a photographic memory—always an asset to any musician! Off camera, he discussed some of the classical music in his repertoire, including the works of Berlioz and Britten, even singing snatches of this and that. Since our sons are both violinists, we had that in common, also. Frank was very fond of the U.S.A., which had been exceedingly good to him and his family. As I drove him back that evening to his hotel, a downtown festival of some sort was taking place, and he commented on all the dozens of U.S.A. flags being displayed, and how much he admired our patriotism. Before his untimely death at age 61 in June, 2000, from a brain tumor, Frank released several videos as well as three RCA Victor CDs and a fascinating CD of him singing harmony duets with old John McCormack records, furthering the historic connection between the two. Also to be cherished are the “Faith of Our Fathers” video from 1996 and the two CDs with the same title. Many of his records from his thirty-year recording career are again being re-released by his wife, Eily O’Grady, on the BrioCD label, and promoted by her and son Eanan. I think it safe to say that Frank Patterson was the defining example of the classically-trained Irish tenor for the second half the 20th century, just as John McCormack had been for the first half. Frank Patterson’s smooth, easy approach to a song, be it Irish, classical or popular music from the past or present, was always delivered in a gracious and tasteful manner with a lyric tenor voice that is instantly recognizable. ED: NOTE: We'd like to thank Malley for contacting us and giving us the opportunity to share with you his personal views on the much loved and very much missed Frank Patterson.